If you are looking for an idyllic Portland experience in the eclectic, artsy, foodie Alberta Arts district, then this is the place for you. Be it a family vacation, executive stay, or accommodations while house hunting, this two-story townhouse is ideal for anyone who may be in need of comfortable home while staying in Portland. Located less than 6 miles from Portland International Airport, your neighborhood stay will find you within walking distance of what you may have read about, the infamous Alberta Street. There is MUCH to discover, enjoy, and experience! 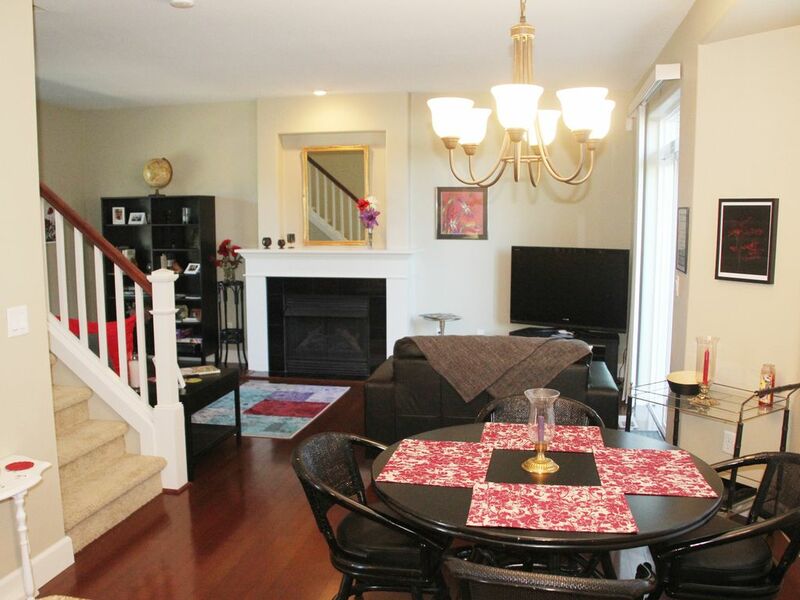 This newer townhouse can sleep up to 4-6 guests (1-King, 2-Queen, plus sofa bed). It has 3 bedrooms, 2½ bathrooms, a fully equipped kitchen, dining area, living room, and an attached garage. The Master Suite includes a master bathroom, a walk-in closet, and its own HDTV with cable. Fast WiFi also available. The location couldn’t be more ideal. You are a short walking distance to popular restaurants and bars, inviting coffee and tea shops, unique boutiques, food carts, art galleries, the Alberta Rose Theater (offering live performances of all sorts! ), yoga studios, neighborhood parks, and even a small local gym if you desire a workout. Portland’s very own New Season’s Market is only a 10 minute walk away where you can shop for all of your grocery and deli needs (including a large organic selection). And if its ice cream you desire, you can’t leave Portland without making a stop at Salt & Straw, which offers some of the most unique and culinary flavor combinations you will ever experience. It is only 8 blocks away! An added location bonus: Milo’s Place is situated steps away from a bus stop, which can take you downtown or to a place where you can connect to Portland’s efficient light rail system (called the MAX train). The MAX train can take you in all sorts of directions, including downtown, the airport, or the Washington Park/Oregon Zoo area. Other delightful Portland neighborhoods are easy to access by bicycle, public transportation, or car. Whatever works best for you! This home is a great place to relax or entertain. The cozy themed bedrooms are decorated with Oregon/Portland artwork and photography to match the Portlandia (Master) and Oceanside themes. The kitchen is stocked with appliances, cooking equipment, coffee and tea. Wi-fi is also provided. Central A/C provided. A gas grill is in the garage if grilling is something you love to do. At the end of the day, whether you have been out and about, or stayed close to home, this is your home away from home. Maximum number of guests is 6. Minimum stay is 3-4 nights (non-peak vs. peak season). I'm a Minnesota native, but have called Portland my home since 1998. My love for Portland, and Oregon as a whole, grows deeper with each passing year. Living in a location that is progressive, environmentally conscious, and accessible to so many outdoor activities that fit my lifestyle perfectly. I'm committed to ensuring YOUR Portland experience while staying at Milo's Place, will leave lasting, positive memories, and the desire for you to return again and again. Milo, the original and first owner of this townhouse, was my Dad. He moved to Portland (from Minneapolis, MN) in 2007 to be near me. Like me, he immediately fell in love with Portland and the Alberta Arts District. He walked the neighborhood, visited the shops, and both he and I frequented many of the outstanding restaurants on a regular basis. In the true and genuine Portland spirit, which makes it such an outstanding city, Milo was well respected and well loved by neighbors, merchants, and restaurant owners. And he loved and respected them right back. The warm, diverse, eclectic, and vibrant Alberta Arts neighborhood provided Milo (and continues to provide for me), an enriching lifestyle that nourishes the soul. The location, the energy, the neighborhood, and the people, in a word, are PERFECT! Milo's Place is my way of honoring his memory as well as providing visitors the opportunity to experience this lovely Alberta neighborhood, and Portland as a whole. Location, location, location…walking distance to several outstanding ethnic restaurants and pubs, as Alberta Arts District is literally just around the corner! Plus an outstanding local grocery chain (New Seasons Market) and accessible public transportation nearby! In addition, when you prefer to relax at 'home', this modern townhouse offers a spacious, yet cozy open floor plan with a very user friendly kitchen. The back patio provides you with a serene place for your morning cup of coffee or your evening glass of wine. The 3 bedrooms and 2.5 bathrooms make it a very suitable place for a family stay or multiple guests. toilet, shower, Double vanity sinks and walk-in shower. toilet, Off of kitchen & dining room. toilet, combination tub/shower, Next to the Queen bedrooms. Master bathroom on second floor has a two sink vanity and step-in shower; additional full bathroom on second floor with bathtub and shower; half bathroom on first floor (no bath/shower). Only 5 miles from downtown. Bus goes directly downtown and is available less than 100 feet away. Garage or driveway, or street parking in front of house. Attached to house, one car garage (fits up to one mid-size car). Large corner sofa, (pulls out to bed), pus leather love-seat couch for two. Backyard patio off of living room. Coffee pot, French press, and Keurig. Fresh locally roasted coffee beans, tea, and K-cups provided. Coffee grinder also available. Basic supplies of olive oil, balsamic and red vinegar, sugar, fresh ground pepper, and other spices. Cook books too. All dishes, glassware, and cooking/baking ware provided. Blender and mixer included. Food processor available upon request. Dining room table seats 4-6, plus two bar stools at kitchen counter. Portable card table and extra chairs also available. 46 inch HDTV in living room and 32 inch HDTV in master bedroom. Front yard plus small backyard. Nicely landscaped with native shrubs. Patio off of living room area in backyard. Small porch in front of house. Great property - great location ! We had a wonderful time. Tina was fantastic and would stay here again! This house is so cute & the owner is fabulous. It snowed while we were in Portland & the owner was there early in the morning with a snow shovel. Great location to so many pubs & restaurants. Close to Alberta restaurants and shopping, near the highway, all-around perfect. We arrived at the house shortly after flying in to PDX. The location was close to the airport so that was a plus. The house was decorated for the Christmas season which was an unexpected surprise. We loved it. There was a very nice welcome card and gift for us waiting too. All the rooms were very spacious, clean and nice. The kitchen had all the bells and whistles. Coffee maker, microwave, spices etc. everything we needed. We went to the local Traded Joes which was close by. Alberta street was the best. Fun and funky vibe for all the bars, restaurants and shops. We tried lots of places and enjoyed them all. Tina was great to communicate with thru out the booking process. Molli helped out a lot during our stay. We would love to come back to Portland during the summer months. When we do we will stay at Milo’s place again. Thanks to all and Happy New Year. The place was all we hoped for. Fun district with interesting places to dine and drink. We’ll recommend to any friends heading to Portland. Our stay at Milo's Place in Portland was wonderful! Tina was quick to respond to all emails during the booking process and was really helpful with tips on dining and things to do in the area. Her townhome was beautiful, modern and so clean! The beds were really comfortable, the kitchen well stocked, and the living area cozy. It was perfect for the 5 of us (4 adults/1 child). So much better than staying in a hotel. The Alberta district was charming and easy walking distance for breakfast and shopping. Tina texted a couple of times to make sure we had everything we needed and once we departed, she very promptly returned our security deposit. We thoroughly enjoyed our stay and would highly recommend Milo's Place. We'd love to come back again some day. Thank you, Tina! Only steps away from the Alberta Arts District which offers over a mile stretch of a variety of locally owned ethnic restaurants, funky boutiques, bars, galleries, yoga, massage, a gym, and a live theatre, plus more. Rates are subject to change until a reservation is confirmed and paid. Monthly rate is for 29 days - maximum stay. Cancellations made fewer than 30 days before scheduled arrival date will forfeit the advance deposit unless the house can be re-rented for all cancelled days. No refunds for late arrival or early departure. 1.8% Oregon Lodging Tax (as of July 18, 2016); 11.5% for City and County Tax. No smoking allowed. Check in time: 4:00 pm; Check out time: 11:00 am.